My lovely wife, with a magnificent painting done by Spring Hofeldt, the featured artist at the Arts Center. 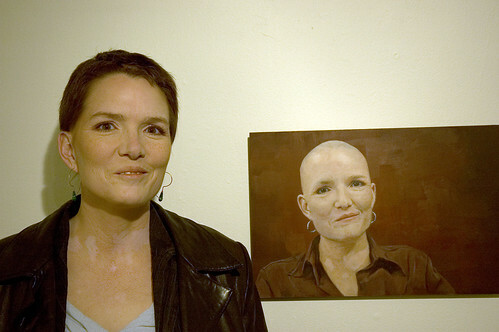 She did a series of portraits of bald people, and has a few other great paintings up, too. I hadn’t seen her work before; she’s a seriously talented painter. Head up to Troy and check her out. Other photos from the great Troy Night Out to come, look for them here. Mark Wood is coming! Mark Wood is coming!